The plans was announced during a tour by government officials to know the challenges facing the border post. After the tour, the officials held a closed door meeting where they talked about trade related activities. Officials during the tour includes Minister for Trade and Industry, Soraya Hakuziyaremye; the Minister for Foreign Affairs, Dr Richard Sezibera, and the Minister for Infrastructure, Amb. Clever Gatete. The Rusumo border is vital for Rwanda as it contributes to 95% of their import, which is convey in a ferry from Dar es Salaam port. 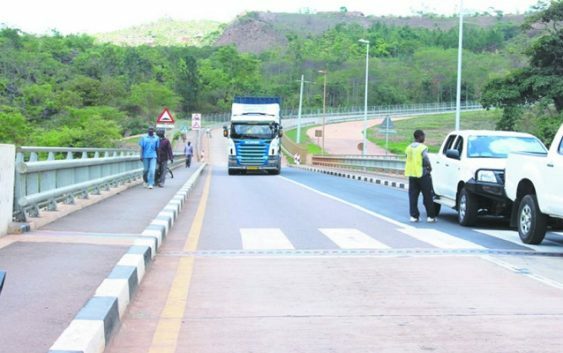 After the Gatuna border went under construction, Rusumo border has become the busiest border in Rwanda. According to her, Some of the challenges that were raised here, include the (slow) pace of flow of trucks that are cleared. This is due to lack of staff from different institutions. During the meeting, the government officials announce action thats needs to be taken. A joint team will be set up to accelerate the construction of a modern cross-border market here to boost trade. Meanwhile, according to official statistics some 270 heavy trucks pass through Rusumo border every day. This is making processing of cargo clearance really hard as their are limited number of staff. Hakuziyaremye said a scanner will be provided which will help in the verification of goods. According to her, it will be available in the next two months.